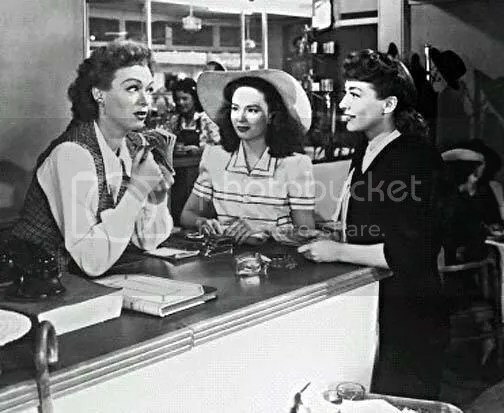 Last night I went to see “Mildred Pierce” at the Castro Theatre with Tony, a good friend of mine and fellow classic film lover. I had seen it on the big screen when I was in Paris, but it’s always so much fun to watch it with a huge crowd–especially at the Castro! One thing that really jumps out at me when I watch it on the big screen is just how spectacular the visuals are–the cinematography, the lighting, and the costumes. My friend Tony is a true fashion aficionado, he can tell you who made what outfit, what costume designer was at which studio during what time period, and who influenced whom in the fashion world. When I remarked on the beauty of the costumes in the middle of the movie and asked him who was the designer, I was surprised to hear that it was not a known name. By way of a quick google search, I found out that the costume designer was named Milo Anderson, a Warner Brothers resident designer who also worked on such movies as The Adventures of Robin Hood and To Have and Have Not. Clearly he deserves more credit than he receives–the costumes in all these movies are spectacular. The first costume that caught my eye was this one–the sort of default outfit for Mildred. She wears it during her interview at the detective’s office and at the very end of her flashback sequence, so throughout the movie we associate Mildred with this outfit. This is a medium-length fur coat with a matching hat, and a dress whose color (we can’t really tell, but I’m guessing maybe brown?) is matched by her gloves. 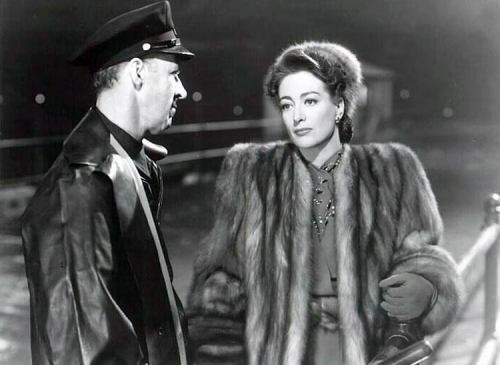 I am not a fan of fur at all, in fact I’m very much set against it, but Joan Crawford wore a lot of it in this movie and it suits her character. Veda first appears in this beautiful white shimmering gown with a large white flower in her hair. The color white I think is meant to be a trick on the audience–we assume she can’t have anything to do with the murder that just took place, because she’s wearing these innocent, virginal colors, and wearing them very well. Though this is not my favorite Veda outfit from the movie (the huge flower always makes me think of Billie Holiday for some reason), it is nonetheless a beautiful creation. I think it actually might be the hair that makes it work. Look at those beautiful ringlets. 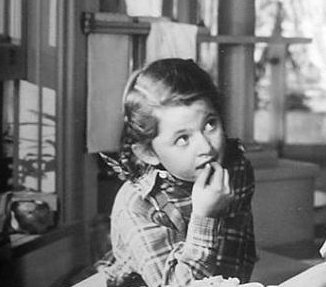 The starkest contrast in this movie is Veda’s younger sister Kay, a tomboy who is forced into ballet lessons when she would rather play football and get dirty. Her costume here really shows her character, and not only her character, but also the versatility of the designer. Among all these beautiful dresses, here he is unafraid to make the little girl look like a total hillbilly. Here is my favorite Veda costume. Look how EVERYTHING matches color-wise, and how she’s using those accessories–I’m loving that pin, and the collar, and never even mind about that glorious hat. I basically want this outfit. Eve Arden is one of my all-time favorite character actresses, and here she is dressed up in this bizarre Hawaiian number that seems almost anachronistic. It oddly suits her character though, and when she came on the screen wearing it, the fashion-conscious Castro crowd all started murmuring to themselves about it! Oh wow, how I wish I could afford it!! It’s my dream to be able to save enough money for her second auction in December, I won’t be able to afford anything major, but maybe like, a pair of shoes or something 🙂 We’ll see what happens! I love every aspect of design related to Mildred Pierce (one of my blog posts included this link to Anton Grot’s set design sketches, including a couple for Mildred Pierce: http://potulentpalaver.blogspot.com/2007/01/anton-grot.html – the first MP sketch is 4th from top, then skip a few)…The entire film has such a great stylized ’40s look…had forgotten about that Eve Arden outfit (love her, she was born in Mill Valley, by the way) – a bit over-the-top, but, at the same time, out-of-this-world. And welcome to CMBA, so glad you’ve become a member. And what about those ankle straps shoes and shoulder pads on Mildred’s suit? Just discovered this site. 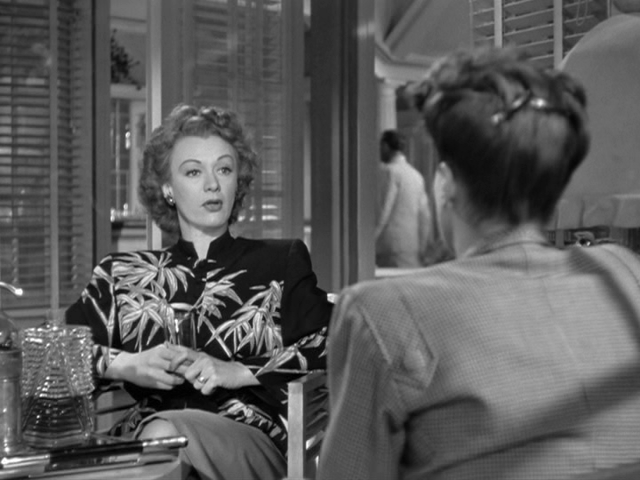 The Mildred Pierce era is my favorite for fashion and furniture design. This is a major reason these old movies delight me to the max. 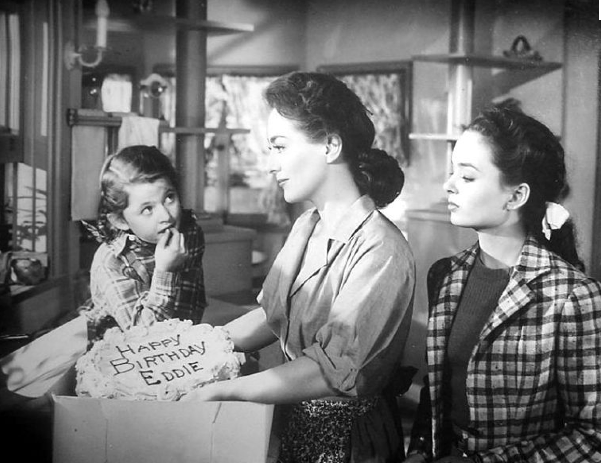 Mildred Pierce is a favorite for other obvious reasons also! I am an accessories fiend, those bags, the jewelry. I’ve paused old films to get a better look at a handbag or bracelet! Someone here mentions Mildred’s ‘fur’ outfit in that opening scene and when she is interviewed. In those scenes my eyes are glued to her sparkly handbag that you never get a good look at as she moves, hiding it. I would love to know where that is now! My son, who works in film, told me that there is always a wardrobe person, always clothing/accessories chosen specifically for films, and that upon completion of a film, a lot of this stuff is just up for grabs, whoever wants it, takes it! I told him that ‘today’s films look as though there IS no wardrobe person (or hair stylist), duds look like they’re hit or miss, depending on what the actors feel like wearing. But that’s just my opinion, having been jaded in this way by those classy old productions. Thank you for your wonderful comment! As I mentioned in the post, I was really surprised to see the name of the costume designer. I had never heard of him! Thanks!!! I Never heard of him either! And in Eve Arden’s photo with that Hawaiian number, your eyes glom onto that gorgeous pitcher also. Set designers in those days were fortunate because ordinary items were designed with aesthetics in mind (like that pitcher that is a work of art eyeball feast) and not just economy. Those were the days!!!! 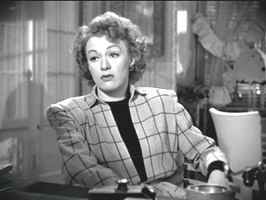 PS………Eve Arden’s Hawaiian shirt suits her character – usually cast as ‘in your face’ femme. I’m not entirely sure, but the dress looks light brown or maybe green? I know, sometimes the colors are a mystery!